I'm not sure if I ever posted that my entry made it through to the first round of the worldwide exhibit of my church. I have to have it display ready and edit my narrative down to 150 words and have it to the museum by the 23rd of January. I just picked it up from the framers. I don't think my chances of getting through the final round are good, but I'm happy that I've made it this far, especially considering that this painting started out as another concept and due to "deadline desperation", I had to crop it and go a whole different direction. Another strike against it is the size. Just 14x12 framed. But, being that it's really my first serious attempt at oils, I'm okay with the fresh tones and expression. I worked very hard on that face...almost giving up. Congrats Kim! Love it and LOVE that it's Alma. So many hidden meanings. Looks very nice. I really like the frame choice. Wow, Kim. I am touched. That made me really emotional. 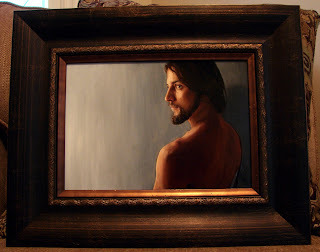 When I first got to your blog the smaller size looked like a picture of the Savior to me. Then I clicked on it to enlarge the image, and saw that you've used Seth's face to represent Alma. So beautiful. Good luck and congrats on making it this far in the competition. You are so talented. Have I told you that before?! Your work is beautiful, but I think I really love the artwork of your family, because I know them and it's more personal.